Peeling gel exfoliators are becoming a hit in Asia, especially in Taiwan, China, Korea and Japan. I am one big time user of peeling gels. It is better than conventional granular face scrub, if you ask me. Peeling gel is not similar to chemical peel. It is a type of cellulose gel that 'scrub away' corneous layer (dead skin) accumulated on the top layer of the skin. It has proven to be effective, at least to me. This post is a personal comparison reviews between 4 brands of peeling gels that I have been using over a period of 1 year. 3. 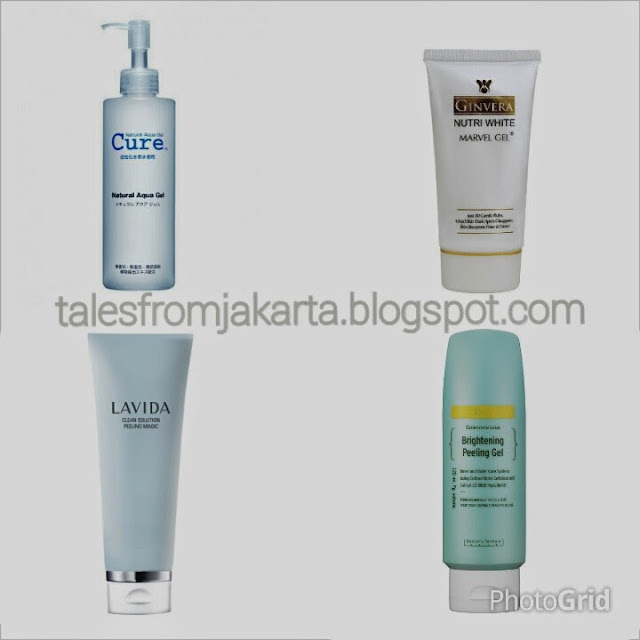 Coreana Premium Peeling Magic (Korea) - brand name changed to Lavida on newer packaging. Which peeling gel is most effective for me? The winner is Cure Natural Aqua Gel! In spite of the fact that each one of them states it should be used once or twice a week, I'm using the peeling gel every alternate days. Cure is the mildest of all. So I can actually use it every night to thoroughly removes traces of make up. It is unscented and preservative-free too. For whitening or brightening purposes, Gowoonsesang is the best. My skin was instantly brighten but it can be too drying to be used every alternate days. Thus, I am using it once a week in place of Cure. For best results, use on towel-dry skin despite the instruction says it should be used on damp skin. Ginvera is the most affordable of all four but I dislike the gel scent. However, it does the job pretty well, I say. It leaves the skin feeling squeaky clean. At the bottom of the list is Coreana/Lavida. The gel texture turns watery once I gently scrub it on my skin but the cellulose residues seem to stick onto my fine facial hair when I'm done scrubbing. Rinsing off the gel takes a lil' more effort too. Its really a nice product.